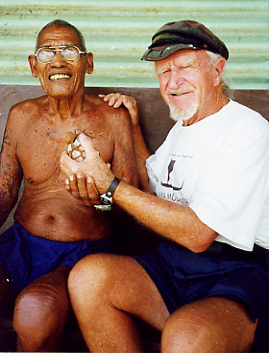 Holding the rokeyok "barnacle container" which he received from Urupiy's brother Repunglap, in 1972, David Lewis returns this sacred navigator heirloom to Urupiy's family. The rokeyok held red clay collected from Yap and was used by navigators at sea to annoint themselves for protection and performing magic. It was also used in the Pwo ceremony to initiate new navigators into the Weriyeng school of navigation. Lewis tells his extraordinary story of this unique artifact in his last book, Shapes on the Wind.